Hulu is testing the waters for an IPO, hoping to get a valuation of $2 billion, according to the New York Times. A Hulu IPO would be a pure play on the transition of TV to the Web. While the company has not yet filed with the SEC, in the past it claimed to have 2009 revenues of $100 million, and is perhaps on track to double that this year. It is not clear how profitable Hulu can be, or how viable its long-term survival will be. Hulu already has to fork over as much as half or more of its advertising revenues to its TV network partners/backers (Fox, NBC, and ABC). But it is not a complete experience. You can’t watch CBS shows on Hulu, and earlier this year Viacom decided to pull its most popular shows from Comedy Central. And NBC’s new owner Comcast has its own plans for streaming TV on the Web. It is not clear how long it will continue to support Hulu. Until we see it’s actual SEC filing with audited financials, investors won’t be able to make an informed decision one way or another. Maybe I’ll be blown away by the numbers and they will change my mind. But from what I know right now, I’d say Hulu still has some proving to do. The streaming video site is the tenth largest in the U.S., with 28.5 million unique viewers in July (according to comScore, which recently changed its methodology—Hulu used to be No. 2 after YouTube). But Hulu is still No. 2 in terms of viewer engagement, streaming an average of 158 minutes per viewer each month. And in terms of video ads served, it is No. 1, with an estimated 783 million video ads served in July, nearly twice as much as the next largest video ad network (Tremor Media). Hulu is preparing to launch a premium subscription service for $10 a month, which will supplement its advertising revenues. Investors are going to want to see some traction there before attributing too much revenues to Hulu Plus. The subscription service will help diversify Hulu’s revenues and make it less solely dependent on advertising, while at the same time creating more loyal users. The subscription service will still shows ads, but it includes a deeper catalog of shows which never expire (as they do on the site). But CBS shows will still be missing, and there will be no Daily Show. Gaps like these will make the $10 subscription a harder sell. Meanwhile, Hulu’s biggest competitor in streaming video is perhaps Netflix, which is streaming more and more movies online, and TV shows as well. 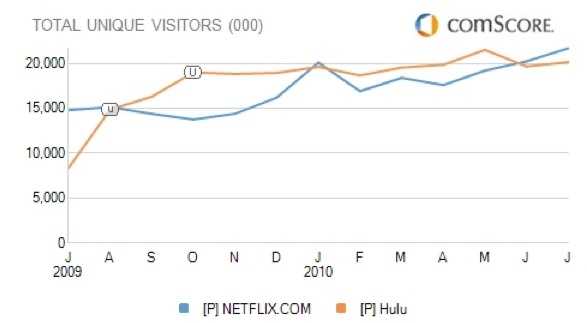 In June, more people went to Netflix.com than Hulu for the first time, and that trend continued in July. If you look beyond TV shows and include Netflix’s streaming movies, it’s catalog of streaming video is arguably better than Hulu’s. I could see some people subscribing to both—Netflix for movies, and Hulu for TV—and still saving a ton of money by getting rid of their cable plans or simply paring back to basic cable. But Hulu needs to fill in some major programming gaps before that starts to happen.